Happy March everyone and welcome to the Daily Pledge in the Celebrations & Events community where we can meet daily to take another person's hand and make our commitment stronger. 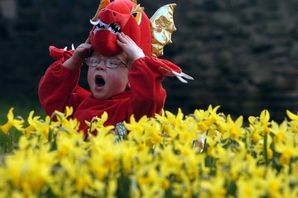 In Old English one name for the month of March was “Hlyda” meaning “loud” possibly because of the roaring March winds. March is the only month with three consecutive consonants in its name in English. An old proverb says that “March comes in a like a lion and goes out like a lamb”, which means that winter is ending and spring is beginning. In ancient Rome before Julius Caesar’s calendar reform, March was the first month of the year. The expression “mad as a March hare” dates back to 1529. It refers to the wild behaviour of male hares during the mating season in March. Fredric March twice won an Oscar for Best Actor. Main Street On The March (1941) and March Of The Penguins (2005) also won Oscars. MARCH is an acronym for the Medically Aware and Responsible Citizens of Hyderabad. The birthstone for March is aquamarine and the flowers are the daffodil or violet. Ready to pledge? Think we can beat our all-time high this year of 651 posts? Good Morning and Happy March MichelleDiane! I am happy to take your hand from February's pledge and will be holding on tight to bring you with me into March! I pledge not to smoke today no matter what! My free hand is EXtended to the nEXt EXer who chooses to pledge the same. Good morning rollercoaster831. Rabbit! Rabbit! We say that on the 1st of every month for good luck. I accept your hand and pledge not to smoke today. My free hand is extended to the next person who chooses to pledge with us. I gladly take your hand rollercoaster831 and take the pledge to not smoke today, and extend my free hand to the next person who promises to pledge another DOF. You missed me:) But, I'll take your hand and pledge not to smoke again...LOL. My free hand is still waiting for the next in line. Have a great day. Thanks for your hand, Sandy. Here is my own, offered to the nEXt to join our pledge to not smoke today, NMW. I pledge today in honor of St. David's Day. Long live the leek dragon! I thank you c2q and with that I give my pledge not to smoke today and offer my free hand to the next EXer to join in on this beautiful march1st. morning. Thank you Kelly for your hand! I will take it and pledge not to smoke today no matter what. I am holding out my hand for the next person who wants to pledge as well. Hi there, Missy, I am happy to take your hand today as I pledge not to smoke, no matter what. I offer my other hand to the next person who is ready to pledge. HI Ellen Yay thank you for your wonderful strong hand to hold as I pledge I will not smoke today no matter what! I offer my hand to the next to pledge. Hey guys...roller's hand is dangling. Grab it! With my one hand I take yours, Roller and pledge to stay smoke-FREE this entire Day. I offer my other hand to whomsoever wishes to join us. Hi Michelle - rbrown53 took Roller's hand. Thanks for your hand @baychaser! I pledge not to smoke today and extend my other hand to the next in line to pledge with us today. I'm reaching out to take your hand rbrown53 and my other hand is reaching out to yours Giulia as I pledge to remain Smokefree no matter what is happening in life and here's my free hand to the next person in line to pledge. Nice March Pledge, Roller! And interesting March facts. It's also National Pig Day! Oink! Wonderful 1131 days of Freedom. Congratulations. I will take your hand and pledge to not smoke no matter what. I offer my hand to to the next person giving support in any way I can. 1 1/2 day DOF. Good morning anaussiemom. I pledge not to smoke today and happily extend my free hand to the next person on their journey.